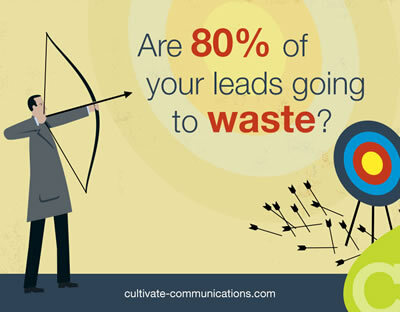 Lead nurturing: Are 80% of your sales leads wasted? Are 80% of your sales leads going to waste? Are you wasting up to 80% of your sales leads? In any other part of your business operations, an 80% waste rate would NEVER be tolerated. Yet, many companies do it every day with their lead generation programs. When a person opts into your e-newsletter or downloads a special report, they’re not necessarily ready to buy from you. In our estimation, only about one out of five opt-ins are hot prospects. Another challenge is that traditional inbound marketing treats lead generation as a discrete event. The marketing team publishes content, holds an event or does something else that generates leads, which are then handed off to the sales team. But salespeople want to be focused on closing, not on sorting out which ones are hot and which aren’t. As a result, many lukewarm leads go to waste. Lead generation is not a discrete event but a process. New opt-ins to your list don’t immediately like and trust your company. That takes time and nurturing. The engine of that nurturing process is quality content, focused on their needs at each step of their buyer’s journey. To do this, your marketing team must develop detailed audience personas, which describe the ideal prospect’s needs, challenges, values and aspirations. Once you have a deep understanding of what motivates your target audience, you can create content that maps to each step in their research, vendor selection and purchasing process. How can you tell where a prospect is in their buyer’s journey? If you are using a marketing automation system, it’s actually fairly easy. When you acquire a new lead, the software places a cookie in the prospect’s browser, which enables it to track the web pages they visit. As they return to your website to download additional resources, you can tell how far along they are by the topics they’re focusing on. For example, if a prospect is downloading white papers, reports and other educational resources, chances are they are early in the process. On the other hand, if they’re downloading product sheets, configuration tips and other late-stage content, they are probably ready to buy. One company that does an outstanding job of nurturing is Widen Enterprises, a developer of digital asset management solutions (DAM) located in Madison, WI. Its website contains an impressive resource library that provides white papers, recorded webinars, infographics and other resources that map to each step in their audience’s buyer’s journey. One of my favorite pieces in the Widen resource center is the DAM Decision Guide. It enables potential buyers to clearly define their needs and ultimately purchase the best DAM solution. It incorporates the customer journey as an organizing principle for the prospect’s DAM selection process, which is brilliant in a meta sort of way! The bottom line is this: No matter where a prospect is in their DAM consideration and selection process, the Widen DAM resource center contains informational tools and resource that can streamline it and make the prospect’s job easier. Isn’t that the ultimate goal of content? How does your company view inbound marketing and lead generation? If your approach resembles Widen Enterprises, congratulations! You’re way ahead of the game. On the other hand, if you only gather leads and hand them off to your salespeople, you may want to reconsider your approach. For more on this subject, download our new lead nurturing eGuide, Are Your Leads Ending Up Just South of Nowhere?